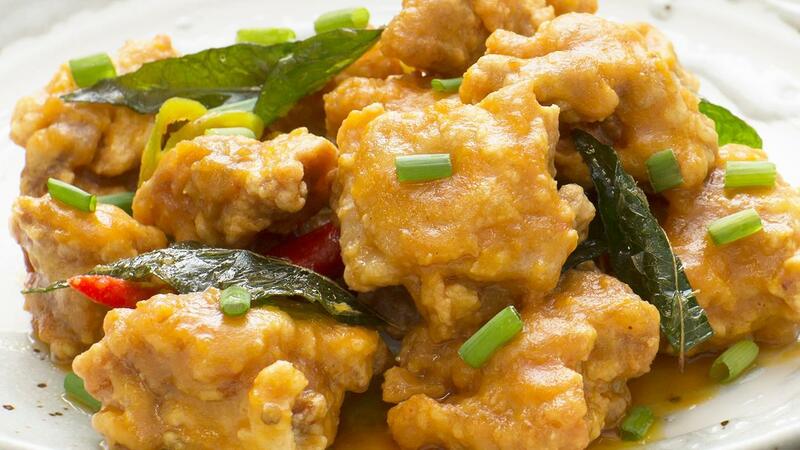 Take your guests on a culinary adventure with this delicious, salted egg chicken recipe! Marinate chicken thigh cubes with Knorr ChickenPowder and egg in a mixing bowl. Chill in chiller for 2hrs before use. Mix water with golden salted egg powder. Form into a paste and set aside. Coat chicken cubes with rice flour and deep fry it in wok with hot oil till golden brown. Strain and drain off oil, set aside. Melt margarine in heated wok, add in curry leaves and chilli padi. Add in pre-mix salted egg paste. Stir fry on low flame till mixture is foamy. Add in evaporated milk, chicken powder and sugar. Bring to a simmer stage. Add in crispy chicken cubes and toss well in wok. Transfer creamy salted egg chicken to plate.